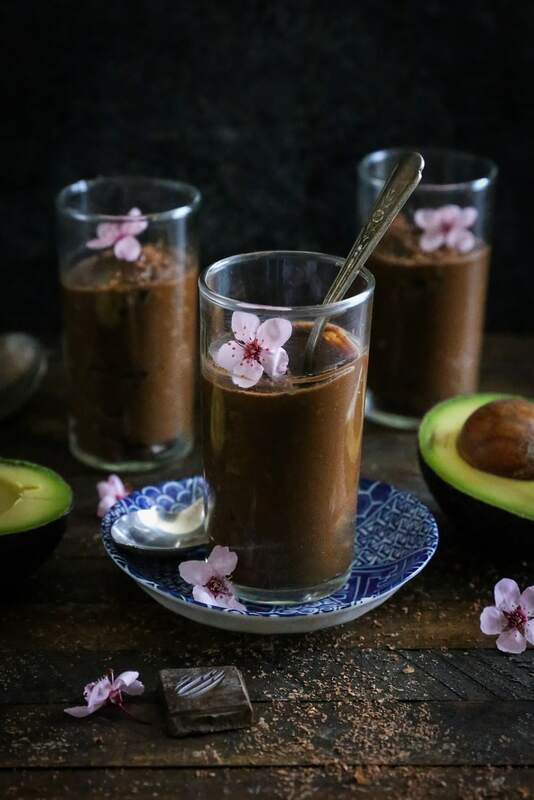 Naturally sweetened healthy 4-ingredient chocolate mousse made with avocado and honey – you’d never know this simple recipe was dairy-free and paleo! True story: all through his twenties, my dad was a skinny minny, and he would eat chocolate mousse and drink chocolate shakes right before bed to try to gain weight. While his strategy did not pan out (the wolvarine-like metabolism runs rampant in our DNA), he bestowed upon his offspring the unrelenting love for – you guessed it – C H O C O L A T E ! ! 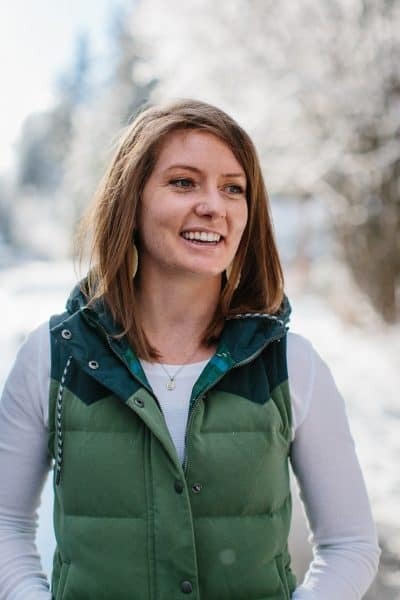 I remember my dad eating bowls of homemade raw chocolate chip cookie dough while he worked in his office, buying 5-pound hunks of chocolate during the holidays (for which he used a chisel, hammer, and/or screwdriver to break into pieces), and drinking chocolate milk every.single.morning. I’ll be darned if I’ve ever saw him touch a piece of fruit-infused dessert. It’s just not on his radar. But chocolate…chocolate is front and center for my dad and I when it comes to desserts. While it wasn’t until my late teens that I tried chocolate mousse, I always loved his story about attempted mousse-induced weight-gain, and was completely blown away when I eventually did give it a go. Now, we all know fully-leaded chocolate mousse isn’t all that great for our bodacious bods (unless butofcourse you’re an ultramarathon runner and are cycling through sugar and fat like a Tasmanian devil), but as it turns out, we can make this ish healthful. This loose interpretation of chocolate mousse is made with all simple, all natural, all healthy ingredients. Rather than using heavy cream and going through the egg yolk tempering process, I used my spirit fruit-veggie – the avocado! It may sound strange, but avocado makes for a creamy, dreamy, thick mousse. I promise you can’t taste it past the chocolate! Food with benefits…let’s talk about this situation. 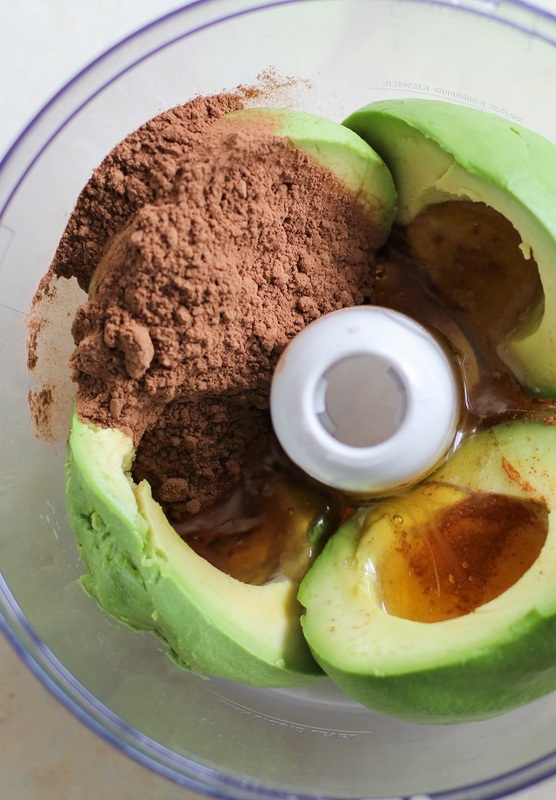 This recipe includes only 4 super simple ingredients (5 if you count salt): avocados, honey, non-dairy milk, and raw cacao powder). Avocados are full of omega 3 and omega 6 fatty acids, which are great for your brain, skin, and digestive system. The healthy fat in avocados boosts your metabolism and helps digest the essential vitamins and minerals in your food. Using raw honey to sweeten the mousse gives it a natural antibiotic and antiviral quality. Additionally, raw cacao powder is full of minerals and antioxidants. Combining these superfoods results in a dessert that spans beyond the reaches of delicious – it is also quite healthy for you! Another MEGA bonus: all we do to prepare this recipe is throw everything in a food processor (or blender) and process until smooth! Add 1/2 teaspoon pure vanilla extract and/or 1/2 teaspoon ground cinnamon. Add a little bourbon if you’re looking for a booze-infused dessert. 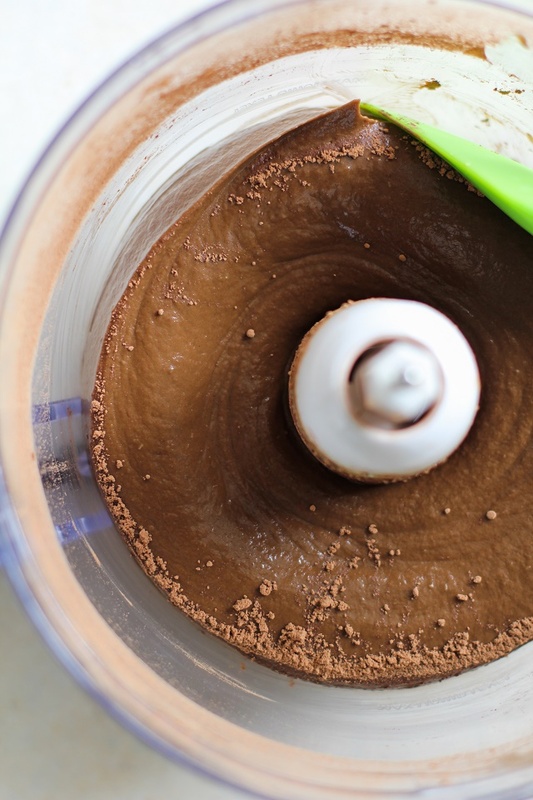 Want to substitute the raw cacao powder for unsweetened cocoa powder? No problem! Want to add a small cooked beet for some extra Vitamins and antioxidants? Much encouraged! Make this recipe vegan by swapping the honey out for pure maple syrup. That’ll do ya, folks! All’s you need is some simple ingredients, a food processor, and a hankering for something duh-licious. Serve with grated dark chocolate and/or coconut whipped cream. Mousse will keep for up to 4 days in a sealed container in the refrigerator. You can also freeze the mousse and eat it like ice cream! Simply thaw for about 8 minutes before scooping. 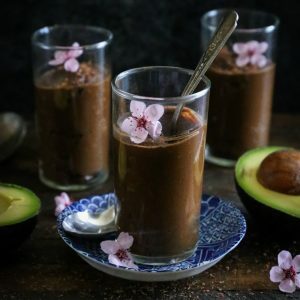 I love avocado chocolate desserts! This looks so creamy and perfect! It’s beyond creamy!!! O yum yum! My mom and dad did the same thing, but with cookie dough and cookies every night! I love this recipe for chocolate mousse! I want to dive into this bowl!! Pinning! 🙂 Happy Monday, dear. that’s so funny that your Dad ate chocolate mousse like it was his job to gain weight, i wish i could do that! I love how few ingredients this has and most importantly that it features the famous AVOCADO!! Ahh this is my fave dessert! I had it once like a year+ ago at a restaurant and of course was thinking “yeah how good could it be”. I was SO WRONG. The only thing that makes it better is how easy it is to make! OMG I need this. Right now. Your dad clearly knows what’s good. Chocolate is always welcome, day or night, in life. Love this creamy mousse! Healthy chocolate mousse? Pretty sure I just died and went to chocolate heaven! 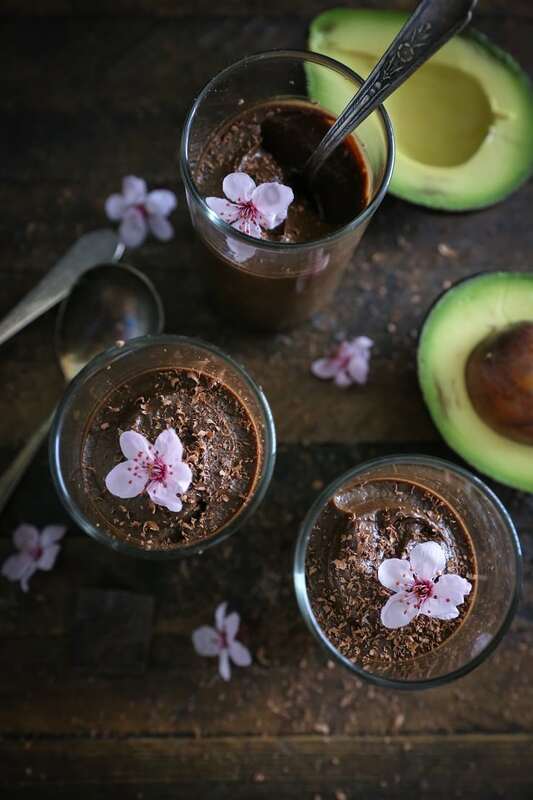 Chocolate avocado mousse is on of my favorite indulgences, especially this time of year!! Oh how I wish I had your dad’s problem! I can’t think of a more delicious way to gain weight. But I think would like this version better than whatever he ate because I have a case of the crazies now and think way too deep about everything I’m eating. Thankfully avocado and almond milk can make mousse just as dreamy! This was really amazing! I served it in a champagne glass with some thawed cool whip topped with a crumbled, stale cookie. I don’t like avocados and served it to my man who doesn’t like too much chocolate. We both loved it. Hello! Just wondering how long you think this would keep in the fridge for? Can’t wait to try it! Can I use bananas instead of avocados, will it has the same mousse texture? WOW! This chocolate mousse sounds amazing! I have a raw cacao based blend, called MitoXcell, that I am going to use in it! I am so excited to try this recipe! What happens if I use regular milk? You can 200% use regular milk. I used almond milk to keep it non-dairy, but you can use any milk of your choosing. Hope you enjoy the mousse! How much bourbon would you suggest adding to the recipe? OMG! What an amazing recipe! I just made it, got inspired and added some gingerbread spice and cinnamon. It’s so yum! Thank you! Would this be weird with full fat coconut milk? can you substitute honey with stevia? If so how much? 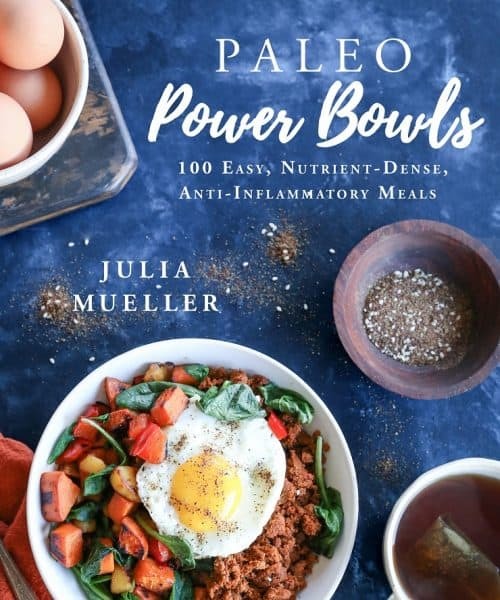 This is amazing, I made it a few days ago and OMG it’s delish) Great recipes and nice pics too.